1 of 4 Whisk flour and salt in a bowl. 2 of 4 Using pastry blender, or in food processor with pulsing action, cut shortening into flour mixture until consistency of peas. Cut in butter. Add 3 to 4 tablespoons cold water, a little at a time. Toss with a fork or pulse in food processor until dough holds together. 3 of 4 Gather dough and transfer to a sheet of plastic wrap; gently flatten into a disk. Wrap and refrigerate at least 2 hours. 4 of 4 Heat oven to 425 degrees F. On floured surface, roll dough into a 12-inch circle. Roll up onto rolling pin and transfer to a 12-inch pizza pan. Fold over edge to form a slight lip. Bake at 425 degrees F for 8 to 10 minutes. Remove from oven. 1 of 2 Cut peel and white pith from grapefruit. Slice fruit in thin slices; cut slices in half. Dry on paper towels. 2 of 2 Spread marmalade on baked crust. Top with cookie crumbs. 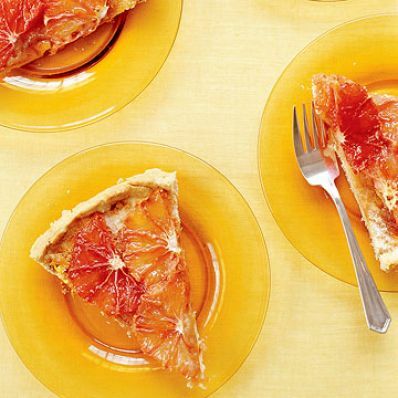 Fan grapefruit slices over crust; sprinkle with 3 tablespoons of the sugar. Bake at 425 degrees F for 20 to 22 minutes, until crust is browned. Remove tart from oven; turn on broiler. Sprinkle tart with remaining 3 tablespoons sugar. Run under broiler for 2 to 3 minutes, until shiny and browned. Per Serving: 10 g Fat, total, 10 mg chol., 4 g sat. fat, 1 g fiber, 114 mg sodium, 225 kcal cal., 3 g pro., 32 g carb.